Internet content giant Alphabet Inc. (GOOGL) was fined a record $5.04 billion on July 18 by the European Union for illegal restrictions on Android smartphone manufacturers and mobile network operators. The stock dipped at the July 18 open, but then momentum took over, and the stock traded to an all-time intraday high of $1,221.59 that day. The stock is in bull market territory at 21.9% above its 2018 low of $984.00 set on March 26. 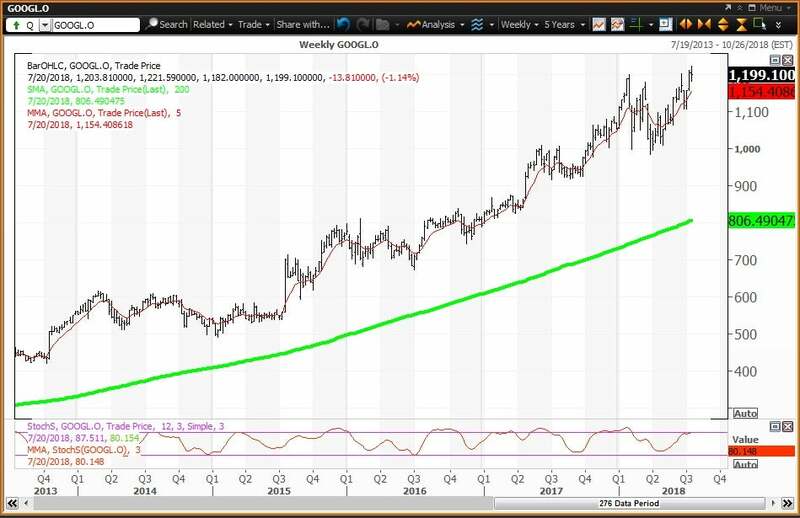 The daily chart for Alphabet shows the importance of a rising 200-day simple moving average (SMA), which is the green line on the chart. The stock began the year above a “golden cross,” which indicated that higher prices would occur. Note the numerous buying opportunities on weakness to the 200-day SMA so far in 2018. The stock is above the upper two horizontal lines, which are my semiannual and monthly pivots of $1,101.14 and $1,142.47, respectively. Above the chart is my quarterly risky level of $1,229.05. The weekly chart for Alphabet is positive but overbought, with the stock above its five-week modified moving average of $1,154.54. The 200-week simple moving average, or its “reversion to the mean,” is at $806.49. The last test occurred during the week of Oct. 7, 2011, when the average was $249.87. The 12 x 3 x 3 weekly slow stochastic reading is projected to rise to 80.14 this week, moving above the overbought threshold of 80.00.